just like the african rift valley, antarctica is spreading. so right after the heights of the transantarctic mountains there’s a big dip, which at some point (when it’s above sea level) will become increasingly volcanic. 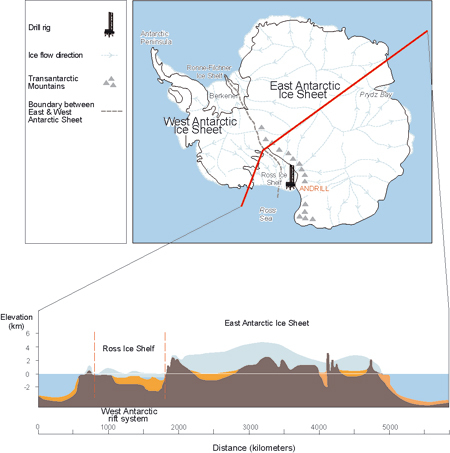 The subglacial volcano has a ‘volcanic explosion index’ of around 3-4. Heat from the volcano creates melt-water that lubricates the base of the ice sheet and increases the flow towards the sea. The volcano is located beneath the West Antarctic ice sheet in the Hudson Mountains at latitude 74.6°South, longitude 97°West. Volcanoes are an important component of the Antarctic region. They formed in diverse tectonic settings, mainly as a result of mantle plumes acting on the stationary Antarctic plate. The region also includes amongst the world’s best examples of a long-lived continental margin arc (Antarctic Peninsula), a very young marginal basin (Bransfield Strait) and an oceanic island arc (South Sandwich Islands). Many extinct volcanoes are very well preserved and others are still active (e.g. Deception Island, Mount Erebus, and the South Sandwich Islands). this shows the edge of the rift in green, along the transantarctic mountains and marie byrd land. and then there’s this – the executive committee range of mountains in marie byrd land. named for an executive committee. it’s very democratic. it’s probably payback for allowing the expedition to be funded. 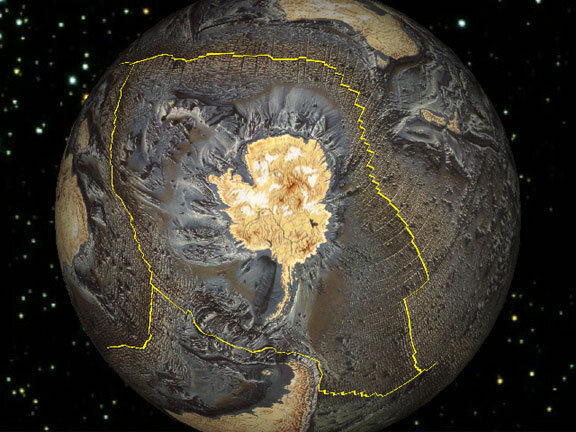 and then there’s this – there’s an apparent asteroid crater in wilkes land, in antarctica, right in the middle of a rift, which may or may not have caused the breakup of the original gondwanaland. The Antarctic Ocean has rifted all around, 360 degrees. There is no subduction noted around Australia, and yet it spreads. There are no subduction zones to take up the spread. 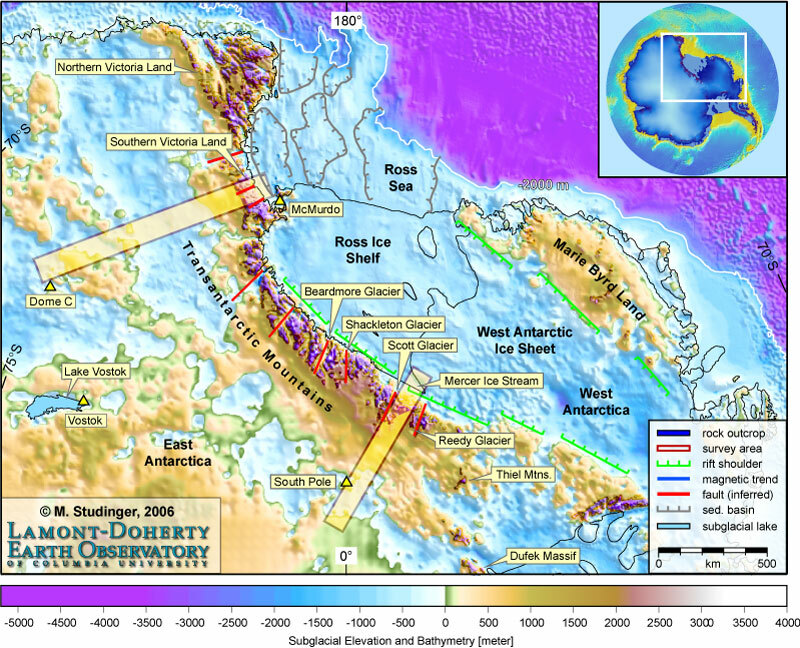 Antarctic topography and bathymetry. 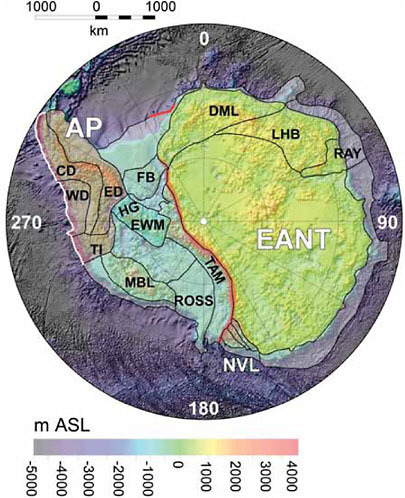 East Antarctica is subdivided into four provinces (Lythe et al., 2000): DML, LHB, RAY, and a large undivided unit (EANT). West Antarctica consists of five major distinctive terranes: AP (comprising Eastern-Central-Western domains: ED-CD-WD), TI, FB, MBL, and EWM. The three northern Victoria Land terranes are grouped together (NVL). 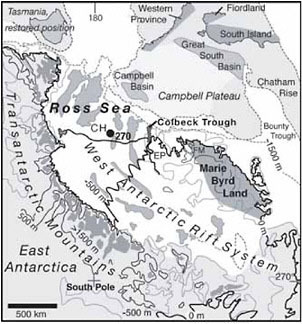 ROSS = extended continental crust between MBL and EANT; TAM = Transantarctic Mountains (red and black lines). Most of the circumAntarctic continent ocean boundaries (outermost polygon boundaries) are the result of nonvolcanic breakup except NW of DML (volcanic; red line) and Western AP (inactive trench, white and red lines) (see Table 1 for more abbreviations). Antarctica is subdivided in two main parts (East and West Antarctica) by the Transantarctic Mountains. In East Antarctica, the immense icecap seats on the continental crust that, for the most part, is above sea level: it is a continental icecap. Instead, in West Antarctica, ice largely covers areas below sea level and, therefore, they form a seacap. Posted on March 5, 2010, in antarctica, research and tagged west antarctic rift, wilkes crater. Bookmark the permalink. 1 Comment. Oh! The mysteries lying beneath that ice cap -species, fossils and even live creatures that will blow our minds and change our interpretation of the planet in entirety!